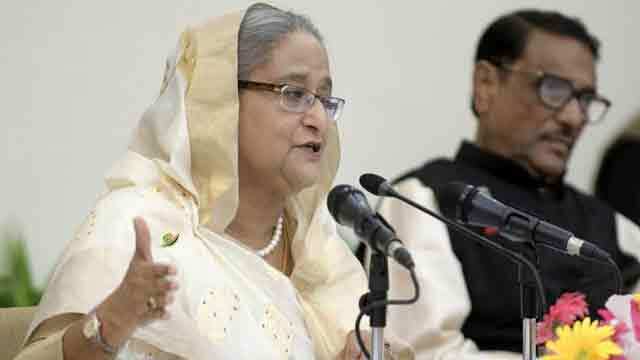 Dhaka, Sep 2 (Just News): Prime minister Sheikh Hasina on Sunday ruled out any possibilities of holding dialogue with opposition political parties on next general election. The next general election will be held on its scheduled time and nobody will be able to resist the election, Hasina said at the press conference on BIMSTEC conference held in Nepal on August 30 and 31. The election will be held in the free, fair and credible manner and the voters will be able to cast their votes for their desired candidates, Sheikh Hasina said. There are various conspiracies to resist the election but no conspiracies will be able to foil the election, as the people will resist those conspiracies, Hasina added. Referring to the Bangladesh Nationalist Party’s demand of releasing of their party chairperson Khaleda Zia, before the election, Hasina said her government has nothing to do to in it as the court had convicted her in a corruption case. She can be freed facing the court or can beg presidential clemency, Hasina said. On Saturday, BNP leaders at a rally in front of its Nayapaltan central office demanded the government should release their chairperson Khaleda Zia to ensure the party's participation in the next polls. Mentioning the name of Kamal, Hasina said that she had doubt about that Kamal would take part in the election. ‘In our country there is a section of people whom people do not vote and they wait for the change of power in an unconstitutional way so that they can gain some benefits,’ she said. Replying to a question regarding the use of Electronic Voting Machine in next polls, Hasina said that the system is modern and it is used in different countries. About the Rohingya issue, the prime minister said Myanmar has committed horrible acts by carrying out falsehood releasing fake photos in social media over Rohingya issue. ‘They have committed a terrible work. They have tarnished their own image with this. They have destroyed their position at the international stage,’ she said. Hasina said the Myanmar president told her that they are ready to take back those who want returning to Myanmar. The prime minister said she never wants confrontational situation with neighbouring country Myanmar.